Rejuvenate the outdoor guest experience with ultra-resilient all-steel seating. 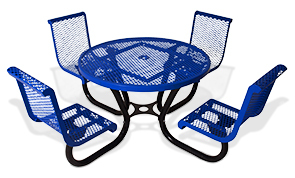 Designed with high volume outdoor use in mind, these one-piece tables featuring diamond pattern steel tops, 4 attached contoured chairs made extremely sturdy, stable and safe with a 2-3/8"O.D. steel tube frame. Engineered ready for lasting service the tops and seats are sealed in an ultra-modern polyethylene finish and the frame with a state-of-the-art powder-coating. These finishes offer superior protection from abrasion, corrosion and UV damage. This table is an excellent choice for a variety of outdoor seating and patio dining settings.